Yesterday I finally gave my MPC1000 a proper upgrade with new pads and buttons. When browsing our favourite MPC part source I also considered a new screen but they seemed overpriced to me – so I did some research with alternative parts from China. ...which seems to run on the same controller and has the same specs. The only thing that seems to be different is the amount and order of pins (see attachment of original and replacement). 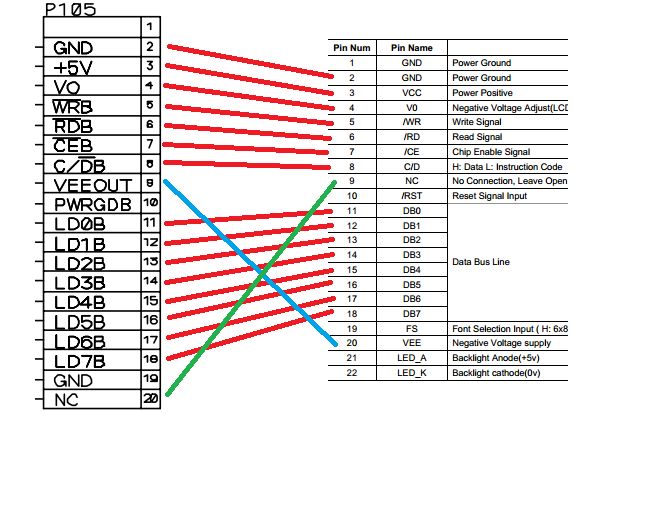 ...and pin #9 on the original pinout needs to be switched with pin #20 on the replacement. Has anyone here tried something similar? How would I handle the two extra pins on the replacement? I also bought a backlight in the same style from the same distributor for my roland pg-10 which wasn't originally back lit. Similarly, there were no real tutorials or posts online explaining the how-to process for that particular unit, but I was still able to glean helpful information reading guides about doing the same thing with other vintage gear not originally backlit. I managed to get that display working and learned a lot in the process, but my knowledge is still spotty. For that install, I had to pull 5v for the backlight anode directly from the power section of the PCB. Although, I found that if I connected the anode pin (LED_A) and logic power pin (VCC) together on the actual display unit, while also connecting the ground (LED_K) to ground, I could get the backlight to light, but it's generally advised against for reasons I'm not sure of. 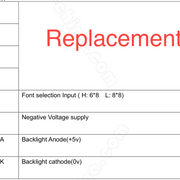 This Is why I ultimately decided to pull a separate 5v for the LED from the power section of the PCB. The problem is the mpc is so much more complex and I don't know if I have the technical know how to find a clean and easily accessible 5v source just to power the backlight's LED. Again, looking at the mpcstuff.com's product photo I can see that the A and K pins on the board have big globs of hot glue on them. Did they just connect the anode (Pin A) to the logic supply voltage (VCC)? Does it actually matter that much to have a clean independent voltage to power the LED? Anyways, I bought a 20 pin ribbon cable online. I crimped one side with dupont crimps on all the wires for simple pin swapping if need be and the other side with a normal 10x2 IDC connector. 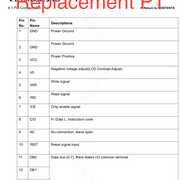 Looking at the two datasheets I made up this chart. I'll experiment and try to figure it out this week. Hopefully I don't blow anything up! Thanks for the post. Just so you folks know, this isn't new information. Basically, do a 240x64 T6963 search and any of the screens that show up will up will work with the MPC 1000 as well as MPC 2500. Yea, the problem is what pins do we switch and how do we power those new pins, aka the LED back light? Maybe you can link us to that or share. I mean pin 9 and 20 is an obvious switch but does the reset pin and FS pin just get grounded? Do I have to put a trim pot on V0 to control contrast or will the mpc still do that through software? That's what were looking for. Were not asking if a standard 240x64 T6963 will work, but rather how do we make it work? You do not need to put a trim pot / resistor to anything. The pinout should be identical to the stock displays that Akai used. All I did was solder a pin header to the common buydisplay.com screens and put it back in my MPC 1000. I never had to change any pinouts whatsoever. The contrast is controlled through software as far as I am aware. The only soldering involved that I can recall is if I wanted to invert the screen. You can even see this evidenced on some install videos on youtube that it was just connecting the default ribbon to the pinheader straight. ...but is there any way to tap those pin outs to install a vga/s-video output? Kind of like what the Roland S760 has. Even the Roland MV8800 I think has a video output jack. Technically, it should be possible.